Compass Canada has invested in editing the following Compass resources for the Canadian market. We are pleased to offer the following Canadian editions for Small Group Studies which can be ordered in Canadian dollars and shipped directly to your church. Please contact our office and we will be pleased to facilitate your order. Once your order has been shipped, you will be emailed an invoice and payment can be made by cheque via mail or online using the form below. This is the newly revised edition of Your Money Counts including a new chapter on dealing with crisis! have found that over half of all divorces are the result of financial pressure at home. Suffocating materialism is robbing people of their spiritual vitality. In Your Money Counts you will learn that the Bible has a lot to say about money. There are, in fact, over 2,350 verses that address everything you need to know about handling money. Indeed, the Bible is a blueprint for managing your finances. Not only is Your Money Counts practical, but in it you will discover the profound impact handling money has on your relationship with God. This book is also availabe as an audio book read by the author Howard Dayton. 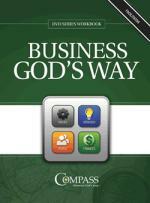 The Business God’s Way book will improve your business and your finances. 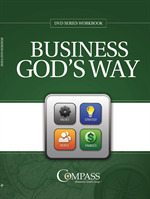 Learn what God says about operating a business and handling money. Business God’s Way is for everyone in business—the CEO or manager of a department, small business or large, prosperous or struggling, whether the business is a start up or well established. “If you are starting or growing a business, you’ll discover that Business God’s Way will give you the confidence and courage to make great decisions. Why? Because what you’ll learn in this book about running a business is straight from the ultimate book of wisdom, the Bible." 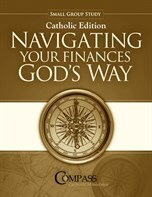 Your Money Counts is a companion book to the Navigating Your Finances God's Way - Compass Catholic and also a great read on its own. Many people are experiencing financial challenges, such as debt, a frustrating job, or inadequate savings. Recent surveys have found that over half of all divorces are the result of financial pressure at home. Suffocating materialism is robbing people of their spiritual vitality. Your Money Counts, is a blueprint for financial sanity. 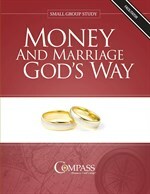 Please note that the small group study workbooks come with 1 free copy of Your Money Counts. 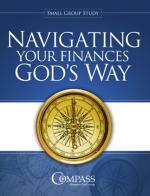 Navigating Your Finances God's Way is a nine week small group study that teaches individuals God’s perspective of managing money and possessions. It provides practical applications of handling finances, and really gets to the heart of the matter. 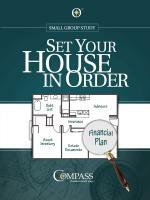 The five-week Set Your House in Order small group study is designed to enable you to assemble and organize your important financial information in just one place. Set Your House in Order is also an outstanding tool to help you plan your estate and manage your current finances. A small group is the most effective setting for applying what you’ll learn in this study.The small group format is flexible and can be taught in a variety of ways. Some examples include; meeting every other week for class to give time to complete practical applications or having five consecutive weeks and meeting a month later to ensure all practical applications are complete. The study may also be conducted in a classroom, seminar or completed by an individual. This six week small group study teaches individuals God’s perspective of operating a business and handling money. Business God's Way is for everyone in business leadership, the CEO or manager of a department, small business or large, whether the business is a start up or well established. Features of study: Practical tools can be accessed in the workbook as well as electronically and on-line. Financial woes can devastate a marriage, but there is a better way—God’s way. This book offers practical, biblical principles to common problems, shares encouraging stories of real-life couples, and provides interactive discussion opportunities for you and your spouse. Whether you’re engaged, newly married, or empty nesters—this book will help you cultivate the joy God intends for your marriage. each week. Preparation for the small group takes about 15 minutes each day and consists of Bible verses to read and questions to answer, which are discussed in the small group meeting. Additionally, there are personal financial exercises to complete. No personal financial information is ever shared within the small group. ...because you will be learning what God says about operating a business and handling money. Business God's Way is for everyone in business leadership - the CEO or manager of a department, small business or large, whether the business is a start up or well established. Note: Each facilitator workbook contains a DVD with the videos for the study with the answer blanks filled in. The student workbook does not contain a DVD and has blanks to be filled in as the video plays. Individual or Facilitator book PRICE: $9.00 plus shipping and applicable taxes. This DVD Series will improve your life and your finances . . .
. . . because you will be learning what God says about handling money. Navigating Your Finances is for everyone--single or married, young or old, whether you earn a lot or a little. Amazingly the Bible has 2,350 verses dealing with money and possessions, and 15 percent of everything Jesus said had to do with it. And as you apply these principles, you’ll enjoy more financial health, freedom, peace and even joy. Individual or Faciitator book PRICE: $11.00 plus shipping and applicable taxes.